I'll have to make a sourdough starter at some point, I'm so very intrigued by it, but scared at the same time! Those muffins sound delicious! Sourdough and blueberries? Who would have thunk? Not me but it sounds perfect. They look lovely and purple to me and I bet they taste good! They look fine over here. Actually I am seeing a late night ski mask run over to my brother's house to steal blueberries from his plants. I've heard that tossing the blueberries in some flour can help to prevent this problem. I'd still take a big bite of one of these muffins! I like the deep purple color. I think they look delicious! 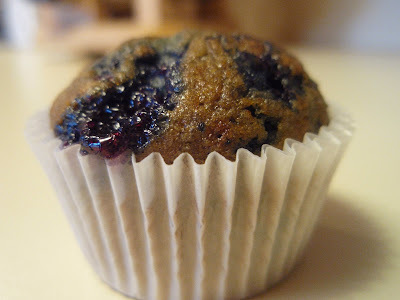 Blueberry muffins are my favorite, so I'll have to try these. I bet they taste good regardless of how they look. 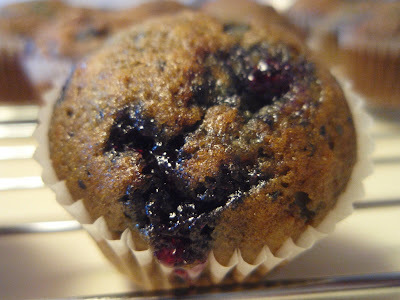 My muffins (blueberry or not) always look icky. It's all in the taste though!! They look great! I don't see any green or brown. I wonder if all my colors are off??? hehe. "Gasp at resulting color and quickly consume in order to avoid embarrassment." - hahahahaha, that made me laugh out loud! your muffins look great to me; i dont see any green! I'm intrigued ...sour dough and blueberries. This sounds like a great muffin combo! You know, sometimes that happens to me as well, but the muffin taste remains the same ...yummy! 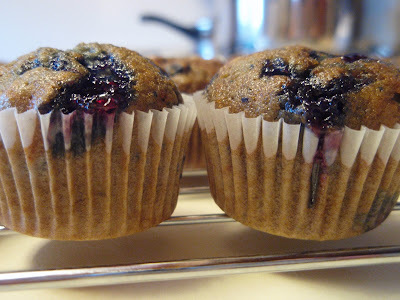 Those blueberry muffins look good! I like the sound of a sourdough muffin. The nice thing about the camera is that Eb can't change what the camera sees - power neutralization factor in effect and he can't change the taste factor...unless you really screw up - You'll still make the Baker's Hall of Fame!!! These muffins look solid! Sourdough and blueberry? Hmm, sounds good to me. I wouldn't worry about the color, they still look great in the pictures. I think they look pretty good. There's nothing you can do about those blueberries. Wait- can you dust them with flour? Did I make that up? I should probably read the recipe again. I bet the sourdough flavor is interesting. I've seen cookie recipes recently where they use yeast.